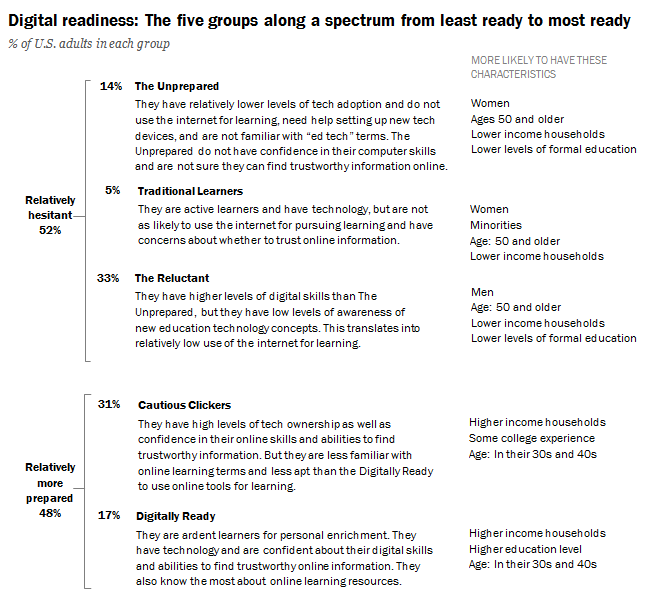 Specifically, we assess American adults according to five main factors: their confidence in using computers, their facility with getting new technology to work, their use of digital tools for learning, their ability to determine the trustworthiness of online information, and their familiarity with contemporary “education tech” terms. It is important to note that the findings here just cover people’s learning activities in digital spaces and do not address the full range of important things that people can do online or their “readiness” to perform them. My grandpa used to always say about learning anything – first you gotta wanna. I saw this in the App Camp on the Fond du Lac reservation. Kids came to camp for two weeks to learn how to create apps using an iPad. How did they get kids to come into a classroom over the summer? The earned the iPads they used in class if they stayed in the program. Now that’s not going to work for everyone – but it does get to the point that it’s not enough to create digital inclusion curriculum, we need to sell the idea of technology to get people invested. In Kentucky, economic developers worked with coal miners to learn to build websites – the reward – a job. I’ve done digital inclusion training – I know that older folks will often get invested to stay in contact with grandkids. Everyone has some reward worth getting over the tech hump! It’s just a matter of finding it.